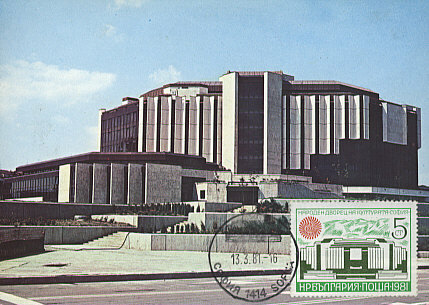 "National Palace of Culture". Congress, culture and tradefair center, comprising 13 halls. 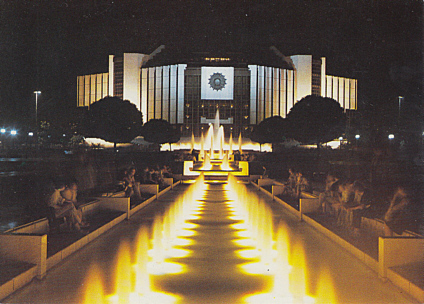 Opened 1981. 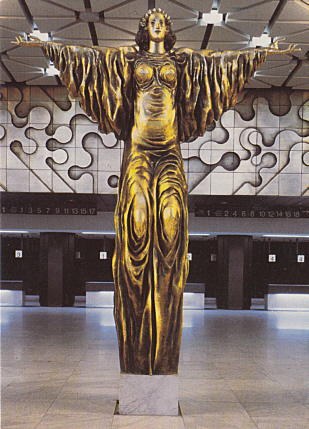 Originally named in honour of the Bulgarian Communist politician, Lyudmila Zhivkova (1942-1981). Reverse Text: "Sofia - Narodniyat dvorets na kulturata 'Sofie'; Sofiya - Nationalny dvorets kultury 'Sofiaya'; Sofia - Der nationale Palast der Kultur 'Sofia'"
Reverse Text: "Sofia - Naroden dvorets na kulturata 'Lyudmila Zhivkova'; Sofiya, Narodny dvorets kultury im. Lyudmily Shivkovoi; Sofia. Der Kulturpalast des Volkes 'Ljudmila Shiwkowa'"
Reverse Text: "Sofiya, Narodniyat dvorets na kulturata 'Lyudmila Shivkova'; Sofiya, Narodny dvorets kultury im. Lyudmily Shivkovoi; Sofia. Der Kulturpalast des Volkes 'Ljudmila Shiwkowa'"
Reverse Text: "Naroden dvorets na kulturata 'Lyudmila Shivkova' - Sofiya - Vyzhrashgane - skulptrnra kompozitiya, z. kh. 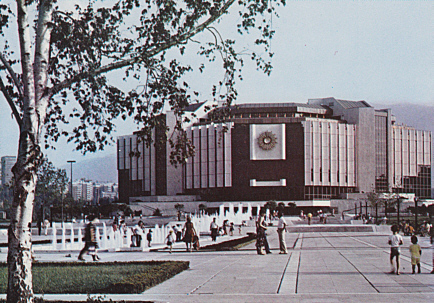 D. Boikov; 'Lyudmila Zhikova' People's Palace of Culture. 'Renaissance' - sculptural compositio. Hon. Artist. D. Boikov"